University of Toronto Press, Scholarly Publishing Division. Paperback. POOR. Noticeably used book. Heavy wear to cover. Pages contain marginal notes, underlining, and or highlighting. Possible ex library copy, with all the markings/stickers of that library. Accessories such as CD, codes, toys, and dust jackets may not be included. University of Toronto Press, 1996. Paperback. Good. Disclaimer:A copy that has been read, but remains in clean condition. All pages are intact, and the cover is intact. The spine may show signs of wear. Pages can include limited notes and highlighting, and the copy can include previous owner inscriptions. At ThriftBooks, our motto is: Read More, Spend Less.Dust jacket quality is not guaranteed. University of Toronto Press, Scholarly Publishing Division. Used - Good. Shows some signs of wear, and may have some markings on the inside. University of Toronto Press, Scholarly Publishing Division, 1996-03-01. Paperback. Good. Downsview, Ontario, Canada: Mennonite Historical Society of Canada, 1993. Book. Good. Hardcover. Fourth printing 1993. Clean sound copy with some highlighting and a mildly bumped rear corner. Makes a very nice clean reading copy with secure boxed packaging! h1. Toronto: Mennonite Historical Society of Canada. Near Fine in Very Good+ dust jacket. 2002. Second Edition; Fifth Printing. Hardcover. 1550560131 . DJ shows very light shelf wear, with a 1/2" tear on top back of DJ. ; A bright, solid book. Dust jacket in Mylar jacket protector. 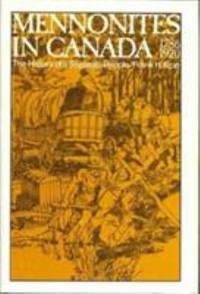 ; 9.6 X 6.6 X 1.3 inches; 480 pages; "Covers the Mennonite experience in Canada from the time of the first documented immigrants in 1786 to the Niagara Peninsula in Ontario from Pennsylvania through the conclusion of World War I. " . Mennonite Historical Society of Canada, 1993. Volume 1: 1786-1920, The History of a Separate People, 480 pages. Volume 2: 1920-1940, A People's Struggle for Survival, 640 pages. Volume 3: 1939-1970, A People Transformed, 563 pages. Pages are all in excellent, clean condition. Many illustrations, maps, charts and tables. Illustrated endpapers in Volume 2. Cloth covers with titles on the spine. Corners not bumped. Illustrated DJs show very little wear. Very light wear on the corners and edges of Volume 2. Very nice set. FINE/FINE. Hard Cover. Fine/Fine. Illus. by Ratchford, Douglas.